Here’s a great graph found on the website of the 2008 Federal Reserve Bank of St. Louis. It reflects a part of the response to the ongoing financial crisis. Think the threat to the economy has been overstated? 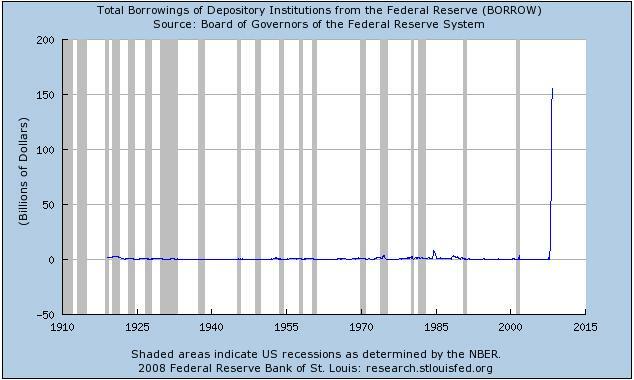 Take a look at the size of the response, reflected in this graph of the Total Borrowings of Depository Institutions from the Federal Reserve. The rules for borrowings have been changed, allowing the dollars borrowed to soar far above anything ever seen in the past.